Kanto Yumi Powered Speakers in Matte Black. Used as my bedroom stereo, great sound with built in class A/B amplifier. In very good condition and fully functional. Includes speakers, remote, power cable, speaker cable, y-cable, manual and original packaging. Kanto YU2 Powered Desktop Speakers - Gloss Red. Includes (2) speakers only. Unit is in overall good condition. Fully functional works as intended. KANTO YU3MG POWERED BOOKSHELF SPEAKERS. Model: YU3MG. These Kanto YU3 Powered Bookshelf Speakers are in great working condition. Kanto YU3 Powered Bookshelf Speakers. 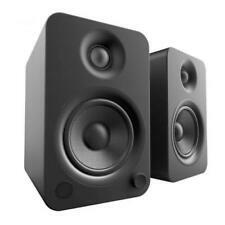 Kanto YU3 Powered Bookshelf Speakers with Bluetoot - Matte Grey YU3MG Specifications. Kanto YU6 Powered Speakers with Bluetooth. Clear Crisp Audio, in bookshelf size. Kanto YU6 Powered Speakers with Bluetooth. Only used in the single digits. Powerful sound with multiple hook-ups. Includes remote. Fedex Ground, ships in 48 States. A precise low-pass filter makes sub8 a perfect match with any Kanto speaker, allowing you to dial in the perfect cutoff frequency. Easily integrate this sealed subwoofer into any preexisting sound system for a superior auditory experience. A precise low-pass filter makes sub6 a perfect match with any Kanto speaker, allowing you to dial in the perfect cutoff frequency. sub6 features a specially designed grille which protects the driver from impact and dust, while allowing sound through with minimal diffraction. A precise low-pass filter makes sub6 a perfect match with any Kanto speaker, allowing you to dial in the perfect cutoff frequency. Peak Power 200 WattsAmplifier Class DDriver 6″ Paper-cone. New in Box Kanto SYD Powered Bluetooth Speaker. Its plug-and-play functionality requires minimal setup and gives you the freedom to enjoy your favorite tunes from a variety of sources. Easily stream music via Bluetooth with aptX technology, transmit high fidelity audio from your TV with Optical TOSLINK, or hook up a turntable with SYD's built-in phono preamp. Rest of unit is functioning as should. Any accessories, cables, or parts, if included, will be shown. Kanto SYD Bluetooth Speaker System Matte Off-Black New in Box Model SYDMOB. The YU5 is our top-of-the-line YU-series bookshelf speaker. Proudly designed in Canada, the YU5 is enclosed in hand-built acoustic MDF cabinets available in smooth matte or vibrant piano gloss finishes. Connect to the AUX input with the included Kanto 3.5mm cable to connect any device with a headphone jack to your YU2. Lighten the load on your computer’s CPU by connecting directly to YU2’s built–in DAC via a USB cable for a fully digital, high–quality audio connection. Number Of Speakers. 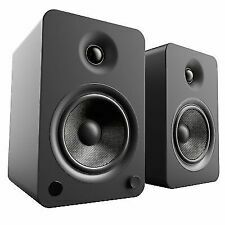 4" Wireless 2-Way Bookshelf Speakers (Pair). Gloss White. Color Category. Model Number. Manufacturer's Warranty - Labor. Manufacturer's Warranty - Parts. Speaker Wire Included. Bass you can feel. A precise, low-pass filter makes sub8 a perfect match with any Kanto speaker, allowing you to dial in the perfect cutoff frequency. If you’re not satisfied, neither are we. It’s that simple. Whether you’re hanging out with friends or kicking it solo, YU4 ensures you’re always in good company. Producing 140W peak power, its Class D amplifier effortlessly fills your room with rich, spacious sound. Carefully designed 4” Kevlar drivers and 1” silk dome tweeters faithfully reproduce your favorite tunes, letting you enjoy them to their fullest. Packed with connectivity, YU4 makes it easy to throw on your latest vinyl with a built-in phono preamp, or sit back and stream your carefully curated playlist via Bluetooth. Crystal-clear, detailed sound for all to enjoy. Play audio from nearly any device with the pair of matte black Kanto YU3 Powered Speakers. They feature an RCA, 1/8" mini, and two optical TOSLINK inputs, plus built-in Bluetooth for wireless connectivity. Producing 140W peak power, its Class D amplifier effortlessly fills your room with rich, spacious sound. Crystal-clear, detailed sound for all to enjoy. Music is made to be shared. Highlights of the Kanto YU4 Powered Bookshelf Speakers include. Kanto SYD Powered Speaker with Bluetooth Matte Off-Black SYDMOB NEW IN BOX!! LOW-PROFILE STAND - Use the included stand to tilt SYD 16° and reduce unwanted vibrations. BLUETOOTH APTX - Stream your favorite music from the palm of your hand. Satisfy your craving for powerful, full-impact sound with YU6. A built-in phono preamp makes it easy to spin your favorite tunes, while Bluetooth™ connectivity lets you keep the party going from the palm of your hand. A precise low-pass filter makes sub6 a perfect match with any Kanto speaker, allowing you to dial in the perfect cutoff frequency. Feel the bass kick with this compact subwoofer. Bass you can feel. With its built-in soundcard, it can stream high-quality audio directly from your computer’s USB port, or connect directly to any 3.5mm AUX jack for maximum input flexibility. A specially tuned bass-port on the rear extends the low end while keeping airflow away from your active workspace. Kanto YU3 4" BT Bookshelf Speakers Grey. Model: 8127007. This Kanto Living YU3 Powered Speakers Pair is in great working condition. Kanto Living YU3 Powered Speakers Pair. 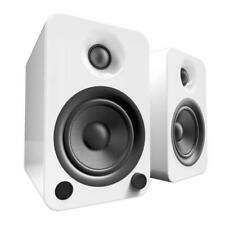 Kanto Living YU3 Powered Speakers Pair, Matte Gray 8127007 Specifications. The Kanto SYD Powered Speaker: Find your rhythm. Kanto SYD Powered Speaker with Bluetooth® and Phono Preamp. SYD’s compact, single-box design lets you save space without forfeiting sound quality. Its plug-and-play functionality requires minimal setup and gives you the freedom to enjoy your favorite tunes from a variety of sources. 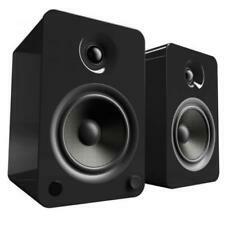 Kanto YU3 4" BT Bookshelf Speakers Grey. These Kanto YU3 4" 2-Way Powered Bookshelf Speakers are in great working condition. 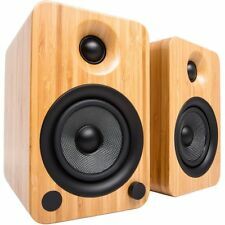 Kanto YU3 4" 2-Way Powered Bookshelf Speakers. Play audio from nearly any device with the pair of matte gray Kanto YU3 Powered Speakers. Kanto SUB6MG Subwoofer. We are here to help. Undeniably loud. Satisfy your craving for powerful, full-impact sound with YU6. A built-in phono preamp makes it easy to spin your favorite tunes, while Bluetooth™ connectivity lets you keep the party going from the palm of your hand. Bass you can feel. A precise, low-pass filter makes sub8 a perfect match with any Kanto speaker, allowing you to dial in the perfect cutoff frequency. New Gear: If you’re not satisfied, neither are we. Kanto SUB6GB Powered Subwoofer (Gloss Black). Authorized Dealer! Kanto YU6 Powered Speakers with Bluetooth and Phono Preamp Wireless Red unused!